Five Minute Facial with Bioré! I've been obsessed with Bioré's Pore Strips since I was a teenager. They've been an integral part of my beauty routine for years! So when Bioré asked me to share my tips for their iconic strips I had a few tricks to share. 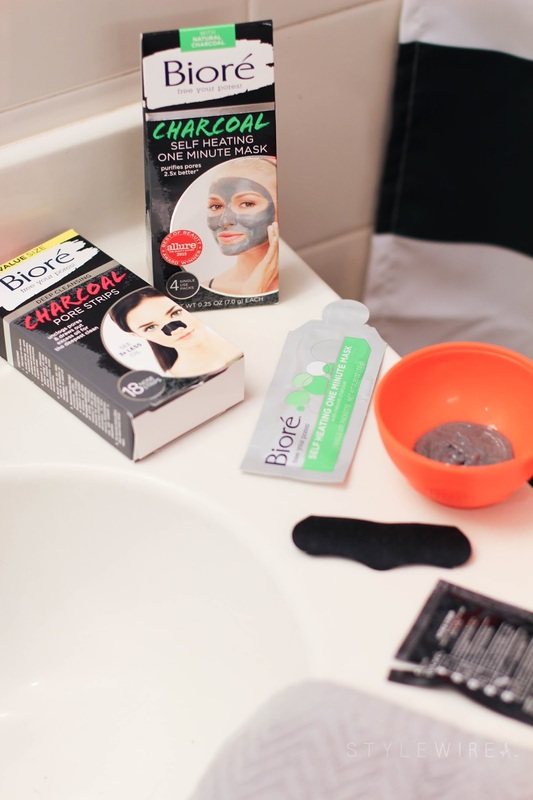 Bioré's products work wonders on their own, but when you pair their Charcoal Pore Strips with their Self-Heating Charcoal Mask, you've got a powerful, grime-fighting combination that makes for a quick, purifying facial. One of my best tips for any treatment, but the pore strips specifically, is to use a little heat and steam to open your pores. I run the tap as hot as I can stand it, wet a washcloth, and hold it over my nose for a few minutes. Then apply your pore strip as normal and wait for it to harden. (Don't over moisten the strip!) Check out the YouTube video below for a peek at my five minute facial routine with Bioré featuring their Deep Cleansing Charcoal Pore Strips and Self Heating One Minute Mask! What I love about these powerful little pore strips is the (kind of gross) sense of satisfaction you get when you remove them. All that gunk, gone; it's a deep down clean you can see! Bioré's Self Heating One Minute Mask is new to my routine, but has certainly earned its spot in my medicine cabinet! It only takes one minute and feels amazing. As you massage this thick, grey mask into your skin it heats up all on its own, drawing dirt out of your pores. It never hardens and rinses clean. I can definitely take a hot minute for that! Taking time for skincare is so important, even if it's just five minutes! This duo from Bioré makes it easy to take time for yourself and take care of your skin.